Modified ecstasy could one day have a role to play in fighting some blood cancers, according to scientists. 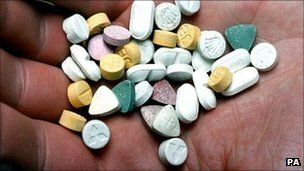 Ecstasy is known to kill some cancer cells, but scientists have increased its effectiveness 100-fold, they said in Investigational New Drugs journal. Their early study showed all leukaemia, lymphoma and myeloma cells could be killed in a test tube, but any treatment would be a decade away. A charity said the findings were a "significant step forward". In 2006, a research team at the University of Birmingham showed that ecstasy and anti-depressants such as Prozac had the potential to stop cancers growing. The problem was that it needed doses so high they would have been fatal if given to people. The researchers, in collaboration with the University of Western Australia, have chemically re-engineered ecstasy by taking some atoms away and putting new ones in their place. One variant increased cancer-fighting effectiveness 100-fold. It means that if 100g of un-modified ecstasy was needed to get the desired effect, only 1g of the modified ecstasy would be needed to have the same effect. Scientists say this also reduced the toxic effect on the brain. Lead researcher Professor John Gordon, from the University of Birmingham, told the BBC: "Against the cancers, particularly the leukaemia, the lymphoma and the myeloma, where we've tested these new compounds we can wipe out 100% of the cancer cells in some cases. "We would really need to pinpoint which are the most sensitive cases, but it has the potential to wipe out all the cancer cells in those examples. "This is in the test tube, it could be different in the patient, but for now it's quite exciting." It is believed that the drug is attracted to the fat in the membranes of the cancerous cells. Researchers think it makes the cells "a bit more soapy", which can break down the membrane and kill the cell. effective in attacking some cancers. They said cancerous cells were more susceptible than normal, healthy ones. However, doctors are not going to start prescribing modified ecstasy to cancer patients in the near future. The research has been demonstrated only in samples in a test tube. Animals studies and clinical trials would be needed before prescribing a drug could be considered. 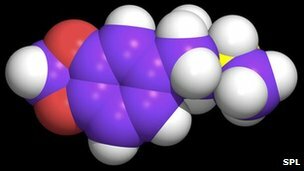 First, however, chemists in the UK and Australia are going to try to tweak the modified ecstasy even further as they think it can be made even more potent. If everything is successful, a drug is still at least a decade away. Dr David Grant, scientific director of the charity Leukaemia and Lymphoma Research, said: "The prospect of being able to target blood cancer with a drug derived from ecstasy is a genuinely exciting proposition. "Many types of lymphoma remain hard to treat and non-toxic drugs which are both effective and have few side effects are desperately needed. "Further work is required but this research is a significant step forward in developing a potential new cancer drug."